Why did I have a fabulous weekend? Because my most favorite boyfriend came to visit. We had originally planned to go out for sushi Friday night, but he took forever on the drive so sushi was a no go. Instead we hit up Portillo's for vegetarian entrees since we don't eat meat on Fridays during Lent. Earlier last week, I texted Matt that I really wanted a cupcake. Usually he just says okay since there isn't much he can do for me from 4 hours away. This time was different. He actually brought me cupcakes. He's pretty much the best ever. These beauts are from Take the Cake in Marion, Iowa. Flavors shown are Strawberry Cheescake, Salted Chocolate Caramel, Chocolate PB Swirl and I Do Wedding Cake. Already missing another I Do Wedding Cake and Key Lime Pie. These were divine! Only one remains uneaten and I will be sad to see it go. My stomach, on the other hand, will be very happy. Since Matt was so nice to me, I thought I would return the favor and let him volunteer for Punk the Monk 5K the next morning. Yeah, I'm rude. Please come visit me so I can make you get up early to stand outside in the cold and walk through snow in the rain. I've ran a few Muddy Monk races in the past and since this one was only about 10 minutes from home (at Deer Grove FP), I jumped on the chance to volunteer. 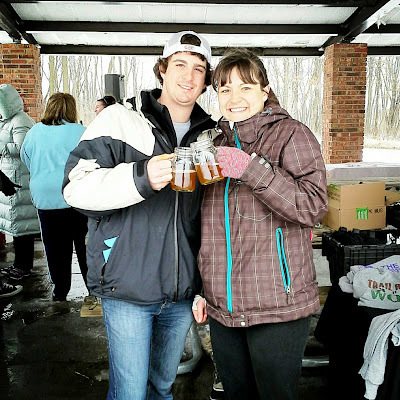 Volunteers get half off a future Muddy Monk race plus post-race snacks and a beer. We showed up at the race site around 8 am and were put right to work organizing packet pickup bags and preparing waivers. When runners started showing up, we also helped out with packet pickup for awhile before we headed out for our official volunteering position-aid station volunteers! This is where the fun really started. Our instructions were to drive over to a different road and then walk the quarter mile or so into the trees to set up the aid station. Just follow the path to the trees. Turns out it isn't very easy to follow the path when there is approximately 5 options and there are trees on about 3 sides of you. One of the guys in our group was convinced we were supposed to go to the right so we headed off in that direction. When that wasn't panning out we headed south. Did I mention we were carrying about 3 jugs of water, a water cooler, a table, and a tent? Tromping through the snow is not very conducive to dry, warm feet either. I thought I made the smart decision by wearing my cowboy boots, but my feet were still wet and cold. A few times Matt or I would run ahead to see if we could find the aid station. One time, Matt ran all the way to the edge of the forest preserve in the wrong direction. Steam might have actually come out of his ears. We were so incredibly irritated. Turns out we needed to head west, like way west. Like it would have been closer to walk directly from the start and not take the van. I made this awesome made to illustrate my point. The blue is the race path, the red is where we walked. See that green dot? That is the race start. We could have just walked across the snow to get to the aid station. Even with the hour buffer we gave ourselves to get to the aid station and setup, we still managed to miss the first few runners. But like true troopers, we whipped up our table and started pouring water. We still managed to have water for 90% of the runners so I am calling this a success. By the time we got to the aid station, it felt like I had run a 5K. Dragging a heavy tent and carrying a jug of water all while tromping through snow is no easy task! I think it would have been easier to just run the race! And we still had to walk back to the start. Ugh! Matt walked the race path back to pick up all the flags and I cut start across the snow to go right back to the start. I waited for him for 20 minutes and was starting to get worried that he had fallen and hurt himself and then he would be really mad when he got back. Turns out, it just took him awhile to get all the flags. For all our hard work, we were rewarded with some Lucky Monk brew and these awesome mason mugs! I tried the Pale Ale and the Porter. Pale Ales usually aren't my fave beer, but I really liked this. Matt liked it so much he bought a pint bottle to take home! Even with this bad experience, I still had a pretty good time and I will definitely volunteer again with Muddy Monk in the future. The entire staff was great and very friendly. Liz even ran the entire race path in snow boots and jeans and fell several times just to help us find the aid station/turn around point. Then they gave me an entire bunch of extra bananas. And those awesome sunglasses Matt and I are sporting in the first picture. We shut the race after party down, but not until we had a few mugs'o'beer and plenty of snacks. The rest of the day was mostly spent laying around on the couch because we needed to rest after all the exertion at the race. I did manage to drag Matt to Kohl's so I could buy him a new shirt to say thanks for helping! I don't think he is going to volunteer for another race anytime soon! The night ended with dinner at a Thai place in Arlington Heights where the curry was so spicy I managed about half before I absolutely had to stop. It was delicious and I brought the rest home but I need to cut the spicy-level a bit before eating anymore. Since I didn't finish my meal, I still had plenty of room left for a half a cupcake and a glass of almond milk. Sunday was a pretty boring day since it rained for approximately 20,000 hours. I had plans to run but skipped out on it when I realized it was raining. Instead I made Matt's favorite oatmeal bake and lounged around on the couch. Matt got a smartphone last week and officially joined the rest of the smartphone world. He is already getting sucked into its magical powers. I can't wait till he starts playing Words with Friends with me. Do you have any funny/bad/awkward volunteer stories?